In part 1, I suggested that in order to really get a handle on The Egoist or even an article published in it, we should attend to the social nature of the magazine, which entails more than reading, for what the act of reading misses is some of the other work magazines do, namely, creating networks of authors, texts, media, readers, ideas, genres, and practices. While we might no longer be able to appreciate the size and feel of the paper The New Freewoman was printed on when we look at it on-screen, the data that the Modernist Journals Project and similar sites generate in the process of digitizing magazines provide the raw materials for visualizing and analyzing components of magazines that cannot be immediately grasped by looking at a single issue but which are as material as the page layout of a magazine and as essential, if not more so, to defining a magazine’s character. I am talking about the kinds of aggregate qualities Mark just ran through as well as networks of authors who appear together in the same issue and across many issues. The big idea I’m exploring in my work these days is that it is out of these networks, created in the pages of magazines much as networks are made today on Twitter and Facebook, that people in the Teens, Twenties, and Thirties formed their ideas of what modernism was. But then what is network analysis? A network is a structure of relationships among entities. These entities, or nodes, are linked along edges, which represent some form of relationship. You could, for instance, create a network of swine flu virus sufferers who were linked by passing the infection on or a network of friends on Facebook. Network analysis graphs these relationships in order to perform a holistic analysis of the structure. 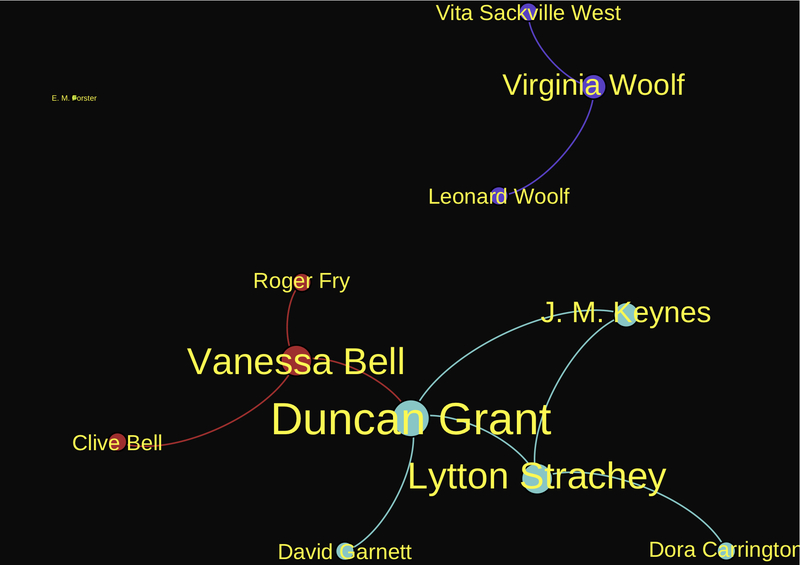 Here is one kind of network that existed within the Bloomsbury Group. What follows is the slightly edited version of my portion of a paper that Mark Gaipa of the Modernist Journals Project and I co-presented at the Space Between Conference on June 15. The paper’s title was “Re-materializing Magazines: A Network Analysis of The Freewoman, The New Freewoman, and The Egoist.” I’ve included in Part 2 some of the slides I presented. 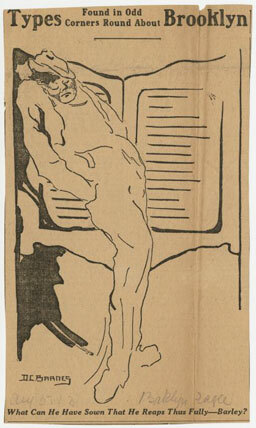 For Mark’s visuals, check out the section of the MJP Lab dedicated to Dora Marsden’s magazines. This work is preliminary to a piece we’re working on for a special issue of the Journal of Modern Periodical Studies dedicated to visualizing magazines, so please share any thoughts, questions, criticisms, etc. Part 1: Stop Reading. Start Graphing.